A couple weeks ago I blogged, Olean, NY-area* school principal arranged purchase, installation, staff training of controversial anti-choking plunger device -- has he also received sales commissions? That put me in a bind. Per a letter I received about three years ago, it's unclear if the Dechoker is approved by the New York State Department of Education. 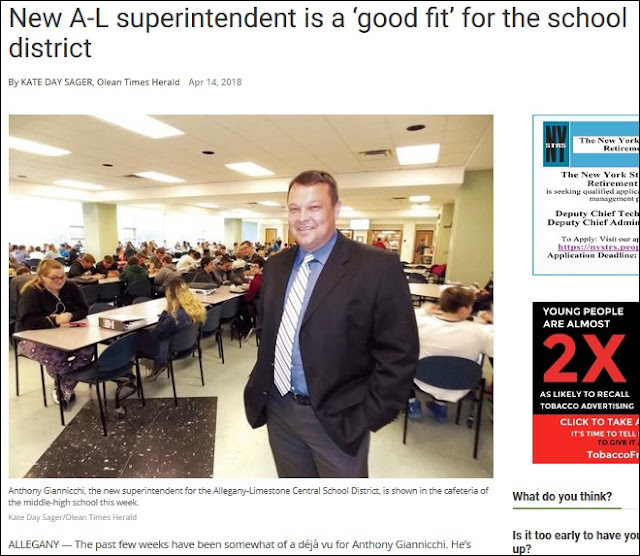 (Allegany-Limestone) Middle-High School Principal Cory Pecorella said the school district purchased two packages of the suction devices for each of the campuses. “(Hite) contacted me and wanted to demonstrate the product for us,” Pecorella said. “We bought right into it. Per my blog, it's unclear if Mr. Pecorella and Mr. Hite have a business relationship. Finally, according to this recent interview conducted by reporter Amanda Gilbert (KWWL-TV, the Waterloo, IA NBC affiliate) with David Stilley MD, Medical Director at Iowa Department of Public Health Bureau of Emergency and Trauma Services, the Dechoker is of unproven benefit and safety. Those concerns seemed like reasonable grounds on which to request an investigation in order to determine if the Allegany-Limestone school's purchase and implementation of the devices was in compliance with applicable guidelines. My problem? I don't know the appropriate office where to file that and per Superintendent Giannicchi's letter, if I ask him or another district employee or the school board how to proceed, they're prohibited from responding. If/when I receive a reply, I'll report the results.